Sparktech supplier of process equipment now presents Bakery Shortening Plant for processing bakery shortening. 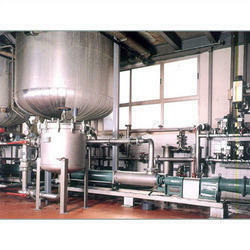 The capacity is dependent upon product formulations and inlet temperature of the product to be processed. Essess Processor-Heat transfer cylinder assembly. Two numbers of interconnected Ess Processor consisting of a single horizontal heat transfer cylinder assembly mounted on an open frame. The cylinder is jacketed and lagged for use with glycol solution. The removable heat transfer cylinder will be internally hard chrome plated. The Essess Processor shaft is concentrically mounted within the cylinder and has four diametrically opposed rows of floating type scraper blades and is driven by suitable motor hose proof to IP55 standard via belts and pulleys suitably guarded. All the products contact parts are made of stainless steel AISI 304 materials. The scraping blades, seal parts and '0' rings will be compatible with the product. The frame and external product non-contact parts are in carbon steel and finished painted with metallic paint. Two number of heaters are provided for heating of the product in case of product solidification inside the product cylinder during a power failure or production stoppage. The esses processor chilling jacket is suitable insulted for eliminating heat loss and cladded with stainless steel sheets for maintaining utmost hygiene. Looking for Bakery Shortening Margarine ?